Although I have selected "Fifty Years in Oregon" as the title of this book, my actual residence in the Beaver State – and on the planet – began sixty years ago today. The opening sentences of this chapter are being written on March 12, 1911, the sixtieth anniversary of an event which, if it had not occurred, would have materially changed my plans in many respects. I am not an Oregon pioneer in the sense that I pioneered myself, or was pioneered by somebody else, into this great and wonderful part of Uncle Sam's domain in the days when it required a vast amount of courage, self--reliance, and a certain degree of recklessness of consequences, to abandon the comforts and safeguards of civilization and start on that difficult journey of over two thousand miles. For those brave souls came to a country of which they had little reliable information, and the way led through deserts, plains and mountains yet without roads, or even decent trails, and inhabited by roving and, in many instances, savage Indians. When my parents crossed the plains in 1847, yet single people – they first met while on that journey – the only settlement of men and women who really intended to become permanent inhabitants of the Oregon country had been established here but four or five years. When F. X. Matthieu, an honored pioneer who is still living, arrived in Oregon in September, 1842, he found very few others here except the Methodist missionaries and members and employees of the Hudson Bay Company. The former were dominated by the single purpose of civilizing, converting, and educating the Indians, and had no fixed intention to reside here permanently. The Hudson Bay people, on the contrary, were firmly established, and were quite averse to the coming of any settlers lest the building of homes and the cultivation of the soil interfere with the propagation and growth of fur-bearing animals. For this reason, they were bitterly opposed to the location of the pioneers along the streams, or for that matter elsewhere. The first real immigration to Oregon was that of 1843, when the Waldos, the Applegates and others of their splendid mold bade good-by to "Old Missoury" and other States which were then in the "West" and started for that far-away region. Senator Benton had already kept it before the public mind for quite twenty years, knowing little of its characteristics or possibilities except that it was farther west and, therefore, must of necessity be a more desirable habitat for human beings than any spot to the east of it! For that is the spirit which for thousands of years has controlled the movements of wandering mankind. Human history does not record a single great movement of people to the eastward in any country. Instinct appears to have driven them with the sun in its daily travels. Of course, there may be a more philosophical and better solution of the fact, but if so, it has not yet been discovered. Besides, as a general rule, instinct in the average man or woman is a safer guide many times than are the results of prolonged investigation. The first emigration mentioned in either profane or sacred history is an account of how Cain, after slaying his brother Abel, moved to the Land of Nod, East of Eden. This so thoroughly disgusted people that from that day to this everybody else has been going West. At any rate, pioneers have always gone West, even long before Horace Greeley promulgated what he gave out as a new philosophy. Indeed, generations before that his own ancestors had set an example which alone prevented his being a noted Englishman instead of one of America's most eccentric and forceful thinkers and writers. But what a transformation has been worked during the past quarter century! If you were asked to locate the "West" at this time, what would the answer be? Is it in the Mississippi Valley? Ask the man living in Wyoming. Is it in Colorado? Inquire of the miner delving in the tunnels of Nevada. Is Oregon in the West? Not literally so, for here we look across to China and Japan, and call that wonderful and almost mystical part of the globe the "Orient"! And, of course, the Orient is in the East, else it would be the Occident. Here we look to the West to see the East and to the East to get a good and satisfactory line on the Old West! And wedded to the sea,"
was emptying its enormous contributions, drawn from the Rocky Mountains, into the waiting ocean through a foaming mouth measuring eight miles in width. It was a dream like this which lured Joseph Holman from his Eastern home, and the winter of 1841 found him located in Salem, then a wilderness without a legal existence or name, an Indian camp, not yet abandoned, called Chemekete Prairie. Here the boy George first saw the light of day, as has been stated, and here he lived until his middle manhood. "I am from the West, sir." In a little while Holman, hearing the same declaration, or rather boast, made to another man with whom the stranger was talking, made it a point to engage in conversation with the Westerner. "I understand you are from the West," he said, after a few commonplace remarks had been made. "What part of the West are you from?" inquired Holman. "My home is in Pittsburgh, sir," answered the Westerner. "Well," said Holman, "as we go here and there we find people from every section, don't we?" "Yes," said the other, "it's a big country – mighty big. May I ask where you are from?" "Me? Oh, I am from the East." "The East?" said the Pittsburgher. "What part of the East?" "Well," said Holman, "I was born in Salem, Oregon, out on the Pacific Coast, but about twenty years ago I went East and settled down in Utah. My home is in Salt Lake." The point of which is that whether in this day and generation the East is west of you or the West is east of you depends altogether upon where you are when making the inquiry. A truthful account of the early settlement of the "Oregon Country" reads more like the creation of a vivid imagination, the work of a trained writer of fiction, than a straightforward narrative of bare facts. Nowhere does the history of mankind reveal a similar "hegira" with apparently nothing to justify it other than mere restlessness and an irresistible desire to move on. The fact was, there was such a limitless area of country – almost measureless in comparison with the number of people who came to claim it – that the average man could not content himself long in one place lest there might be a better one farther on toward the setting sun. The true pioneer spirit had a lodging place in the composite Western bosom. The man who had been born in Pennsylvania, for instance, and had gone to Ohio or Illinois in 1840, acquired a quarter section of good land, built a comfortable log cabin and had broken up most of his "prairie," saw visions of a better country 'way out on the Pacific Coast, and, through fear that some other man should get there first, sold out "for a song" and joined the great caravan which moved on to the land of promise. In truth, there was much more room than it was possible for the pioneers to occupy. The very immensity of the opportunity created a veritable sense of intoxication and a condition of instability, which interfered with the development of any one region. The roving disposition of the pioneers of the last century reminds me of scenes I have frequently witnessed on the farm among the animals – for be it remembered that I never had a home save on a farm until thirty days before I moved into the executive offices in Salem in January, 1899, and my love of animals, inborn, has been strengthened by my prolonged association with them. Observation of their habits has often brought out the most astonishing exhibitions of what some people call instinct, but which is often far above occasional displays of what in many people is termed by courtesy intelligence. It must have been this same sort of observation which constrained "Bab" – a very versatile and spicy syndicate woman writer of two decades ago to close a remarkably clever treatise on Man and his characteristics with this confession: "The fact is, the more I have been thrown in contact with men and the greater my opportunity for studying their traits and tendencies, the deeper has become my respect and admiration for dogs." With this little digression, which is pardonable I hope, let us return to a consideration of the pioneers, who abandoned a comfortable competency, already assured, for what appeared to have as little of tangibility as the "baseless fabric of a dream." With a boundless field in every direction there was far less of contentment than where opportunities were restricted. Frequently on the farm I have fenced off a portion of a pasture intended for the use of sheep, keeping it separate, in order that the grass might attain a growth that would afford real nourishment, when needed, to the flock. After the older portion of the pasture had been literally "eaten into the ground," after the manner of sheep, upon turning them into the fresh, luxuriant grass, the really hungry animals, instead of feasting near the entrance, would at once begin an exploration of the whole area of the new-found bonanza in vegetable wealth – eating as they ran and bleating as they ate. And I have, just at the beginning of harvest, fenced off an acre of splendid wheat, yielding thirty bushels, for the benefit of a dozen hogs which needed thus to be tided over during the particularly scant part of the season. Within an hour of their admittance there would be no square rod of that acre that had not been trampled down and sampled by the bogs, whose appetites could have been satisfied to the full without going more than twenty feet from the gap. So the pioneers of the first half of the last century were dissatisfied with the conditions prevailing in Illinois, Iowa and Missouri, as well as in other "Western" States, and gathered their limited substance together for the journey across the plains. The great and fertile prairies of Kansas and Nebraska presented no attraction to them. Indeed, Illinois and Indiana, as well as Iowa and Missouri, were but half settled. The rosy representations of the possibilities of the Pacific Coast, with its salubrious climate, were irresistible. And then, besides, it was farther West – which constituted one of its strongest appeals. There were two marked differences between the great immigration to Oregon in the '40's and other movements leading to the subjugation of new countries. One was the remarkable distance – more than two thousand miles – and the other the innumerable hardships which were certain to be encountered and the danger of being attacked by the savage tribes of Indians found everywhere. But, far from discouraging the hardy settlers, in most cases these features appeared to be an actual incentive to make the journey "or bust." With a degree of courage almost beyond classification, even the women accepted the situation with as much enthusiasm as the men, and often furnished the nerve which was necessary to carry to a successful issue the gigantic undertaking. A man is but a weak brother, at best. He was always so. Even Adam fell the very first time he was tempted, as we are informed in his only biography, and when questioned as to the origin and development of the little affair out in the Garden, sought to defend himself by saying his wife was entirely to blame; and for this instance of ungallant cowardice I desire to say that he is the only one of my ancestors – at least those of whom I have any definite knowledge – that I am not extremely proud of. From his day to the present, woman has been the burdenbearer of the race, the center of the home, the mainstay of civilization, the foundation of society, the mainspring of every commendable undertaking of man, and performs her never-ending duties with a patience and allabounding love which entitle her to a crown not yet accorded her and a universal homage which thoughtless and selfish man should yield her with his every breath and pulsing heart-beat. "Mr. President, I was very much interested in the eulogy the orator of the day paid to the Pilgrim Fathers, all of which was no doubt deserved; but I want to say a word for the Pilgrim Mothers. All my life, Mr. President, I have heard speakers sing the praises of the Pilgrim Fathers for the great hardships they underwent. It has always been the Pilgrim Fathers this and the Pilgrim Fathers that, and I think the time has come when we should give due credit to the Pilgrim Mothers, for they not only endured all the hardships of the Pilgrim Fathers, but, in addition, endured the Pilgrim Fathers besides!" Taking the privilege of indulging a few words of personal reference, I may say that I belong to a family of pioneers whose wanderings began in 1636, when two brothers, Thomas and George Geer, came to America from Devonshire, England, and settled in what is now Windham County, Connecticut. These young men, fifteen and seventeen years of age respectively, soon after landing in Boston found their way to the interior where each acquired a tract of land. The archives of Windham County contain at this time descriptions of their holdings by "metes and bounds," copies of which I have in my possession. The father of these two young pilgrims who had the grit and ambition to seek the New World was a farmer in Devon County, England, Jonathan by name, but he never left the "old country." On February 17, 1658, George Geer married Sarah Allyn. They had eleven children, the second of whom was a son, Jonathan, born May 26, 1662. Jonathan married Mary -? ?-, date of marriage not known; to them seven children were born, the first being Jonathan Jr., who married Elizabeth Herrick June 17, 1721. Of this union, five children were born. Losing his wife in 1743, Jonathan married Hannah Putnam in 1745, by whom he had two children. His first child by his first wife was named Aaron, born on May 7, 1722. Aaron Geer married Mercy Fisher, of Preston, Connecticut, on January 20, 1742, by whom he had four children. By a second wife, Isaiah was born in 1765. This son was married in about 1790, his wife's maiden name being Carey; to them several children were born, among them Aaron, Joseph Carey and Irene. Joseph Carey first seeing the light of day on February 5, 1795. His sixth child was a son named Heman Johnson, born September 23, 1828, who was the father of this writer. 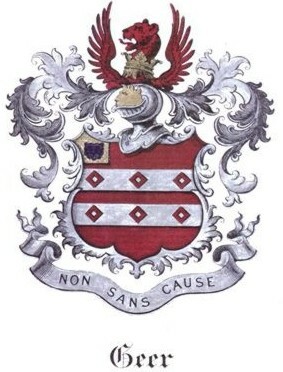 Joseph Carey Geer, my grandfather, was the first of his name to "come West" all his ancestors having remained in Connecticut or the States immediately adjoining. In 1813, he enlisted as a private in the war then being waged between the United States and England, and in 1815, at the age of twenty years, married Mary Johnson, a native daughter of Rhode Island. Three years later, having accumulated some property, consisting of two horses, a wagon, a bolt of cloth woven by his wife on a hand-loom, two children, Ralph C., aged two years, and Fred W., an infant, and one hundred dollars in money, he bade a long farewell to Connecticut, the home of his ancestors for nearly two hundred years, and started for the Northwest territory. Crossing the Alleqhany Mountains, he settled in Union County, Ohio, where for two winters he taught school, working in the summers for neighboring farmers for the princely sum of eight dollars a month. I heard him say in his latter years, when recalling his early experiences in Ohio, that he could always get work on the farms, but could not succeed in having his remuneration increased. In 1821, he leased for six years a small tract of land near where the town of Woodstock now stands, but sold it the next year and leased a larger place on the same terms on the Big Darby Plains. Here he built a house and raised two crops, but being driven out by malaria, so prevalent from July to November each year, he moved in 1824 to Madison County. Here he bought a splendid farm and prospered, giving special attention to the raising of fine stock. When after twenty-two years of persistent effort in Ohio he decided to go West again, he was a thriving farmer surrounded by a family of five sons and five daughters, the two older sons having in the meantime surrendered to the world-wide reign of Dan Cupid and taken unto themselves wives from among the fair damsels of the immediate neighborhood. Speaking once of his early married experiences in Connecticut, Grandfather Geer said: "I found, after working from daylight until dark for three years, that I could never make anything on that poor, worn-out land. So I concluded to go to the 'Far West,' as Ohio was then called, and on September 10, 1818, with my wife and two little tow-headed boys, less than one hundred dollars in money and a light team, I bade farewell to the old Geer farm and joined a company of about forty – Burnhams, Hathaways and Howards – and crossed into the Mississippi Valley, being the first Geer to venture West, as far as I can learn." In the winter of 1839-40, however, after having become well provided with this world's goods as the result of twenty-two years of bard labor, with a good farm improved with houses, barns, orchards and all that would insure a great degree of comfort for the remainder of his days. my grandfather again surrendered to the curiosity to know from personal observation what there was of a desirable nature farther West, disposed of his farm, and with all his children, accompanied by his sister, Mrs. Irene Eagan, and her large family, chartered a steamboat at Cincinnati and started down the Ohio River. Their destination was Knox County, Illinois, where it was rumored there was better (?) land. No doubt, a still further incentive to make what seemed, or would now seem, a great sacrifice was found in the fact that it was several hundred miles farther west. As to this fact they were taking no risk. This journey was made in September, 1840, and my father was then a boy of twelve. I have often listened to his description of the intense excitement which was encountered everywhere by reason of the famous presidential campaign, then at its height, between William H. Harrison, "Tippecanoe," and Martin Van Buren. Log cabins and coonskins were universally in evidence, and the extravagance of the partisan demonstration was a revelation to the boy, not yet in his teens, who had never before been five miles from the little town of Summerford in Madison County. Arriving in Illinois after a very tedious voyage up the Mississippi River, my grandfather purchased a farm near Galesburg, in Knox County, and went through the same general experience which had been his in Ohio. Within seven years, however, being exposed to the Oregon fever, he contracted such a serious case that in the spring of 1847 he disposed of all his property, except the necessary teams for the journey, and started for the Pacific Coast, arriving at Oregon City in October of that year. Two years before that his son, Joseph Carey, Jr., had come to Oregon, and his son Fred, with his young wife and two children, one year before, had joined the great westward movement in 1846. This, in outline, is the experience of a typical pioneer, who in the course of the first fifty years of his life, after coming to maturity in a New England State, made two farms in the Central Mississippi Valley, where be wrought for twenty-nine years in the subduing of such adverse conditions as are always to be found on the frontier drove an ox team two thousand miles across deserts, uninhabited plains and frowning mountains to a country practically unknown and began making a new farm on the west bank of the Willamette River, opposite where Butteville now stands. Grandfather Geer lived thirty-four years after his arrival in Oregon – passing into the other life August 27, 1881, aged eighty-six years and six months. I am perfectly justified in saying that he lived an upright life in all respects and died without an enemy. He was a remarkably industrious man and was endowed by nature with a sunny disposition which endeared him to all. In clearing land on his farm in 1856, he became overheated while burning brush and stumps, and as a consequence cataracts formed on each eye, which, because of inefficient treatment, resulted in total blindness. During the following twenty-five years he saw no ray of light, but notwithstanding this great affliction his cheerfulness never deserted him. He was blind the first time I ever saw him – I was then a chunk of a boy. I remember how he had me stand by his side, in order that he might get a line on my stature, physiognomy and phrenological development to date, and he insisted that I read for him, that he might determine bow far I had advanced in that direction. There was a wire stretched between two posts, about fifty feet apart, and by means of an attached ring he would walk from one post to the other for hours every day in pleasant weather for the purpose of exercise, using the ring as a guide. I used to watch him as he walked along his well-beaten path, and I am sure that the first sentiment of pity I ever felt was excited by the sight. He was the first blind man I had ever seen, and I am certain that until then I had never understood that people ever lost their eyesight. We lived thirty miles from Butteville – a distance so great in pioneer times that it was not often covered for the sake of a mere pleasure trip. A few times we had been to Butteville, however, and I understood that we went there to visit my grandfather. I thought much more of him than if he had not been my grandfather. I didn't know why, except that in a general way your grandfather is a better man than his neighbors, and, besides, he makes more over you. And that helped some. But one of my earliest and greatest surprises came when, after returning from one of these visits, I learned through listening to the conversation at the fireside that my grandfather was my father's father! Somehow this phase of the situation had never presented itself to my mind, if I had any – which seems doubtful, as I look back and recall the circumstances – but the astounding revelation served to impress upon me the fact that the men who are the fathers of the children we know, themselves at one time had fathers, and that some of them were still living. I had never delved any further into these mysteries than a cursory examination of the first strata of cause and effect. "Oh Lord, when Thou art good, Thou art too good!" Next Chapter - A history of the trail westward taken by John Eoff, T.T. 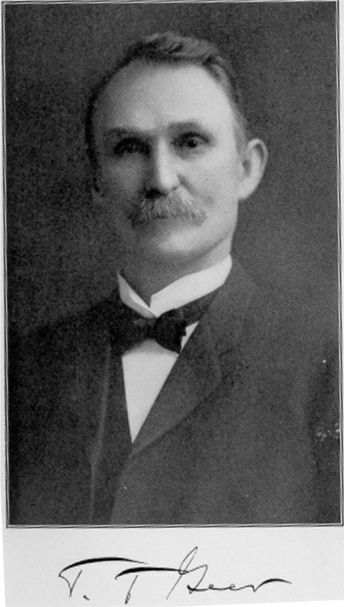 Geer's other grandfather, John Eoff.